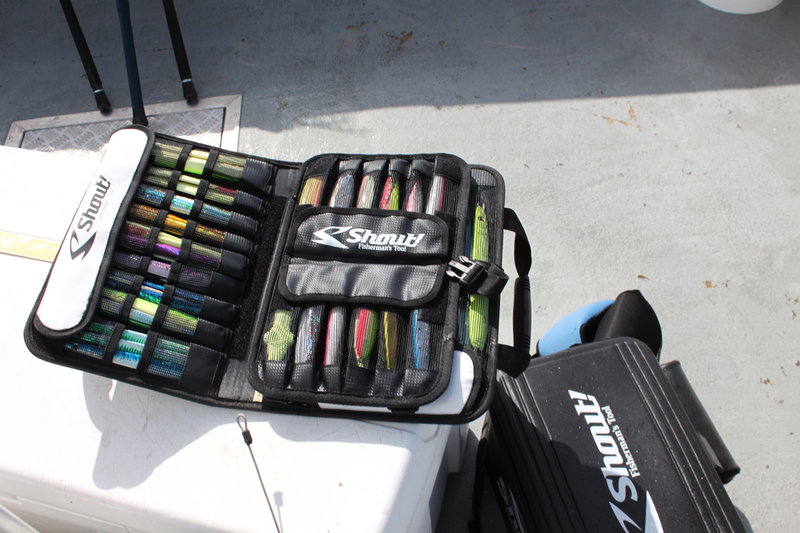 I first bought the Shout Jig Bag System III in white (Medium and Long) and a Shout Separate Jig Bag II. It’s been over a year (2012?) 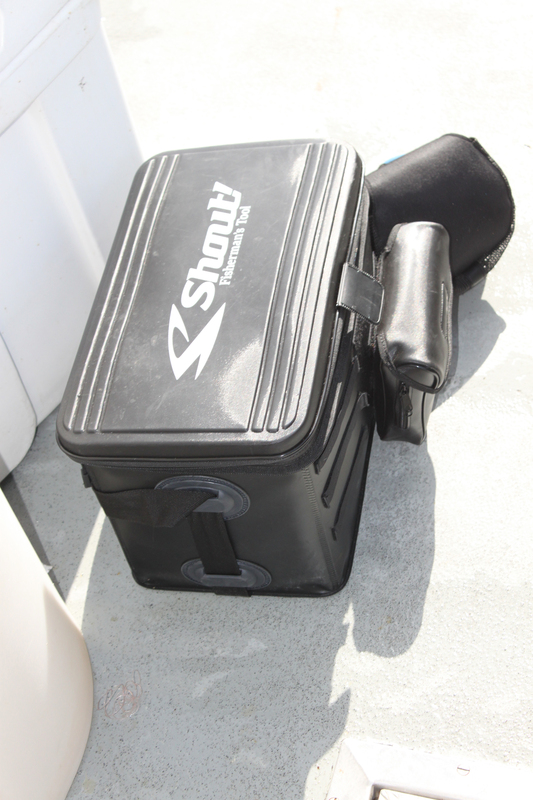 now and the items have been with me in over 20 fishing trips, some being 3 day long trips. I had overloaded the bag and now have reduced the amount of jigs I carry. In the pictures you will actually see a reduced amount of jigs in comparison to what I used to carry. The only issue I’ve had is a small whole in one the flaps that holds the jigs in, you can see it on a picture below. So far I have no complaints and the small tear has not gotten any bigger. I may just patch it. The bags is efficient and well made. The items above do pass, since the first whole tore a year after I bought it. It is worth spending the money. (edit 5/4/14) It’s 2014 now and the bag still looks as I first reported. The Shout Jigger Bag is a hard item to get, it flies off the shelf very fast and for a reason. So far I like the bag. At first impressions the bag looked and felt flimsy. But after loading it and carrying it to three different jigging trips and a mixed trip I can say flimsy it might not be. Only time will tell, so far the bag has fallen off a boat’s bench two times already and held up and still looks like it did when I first bought it. I am digging this bag. 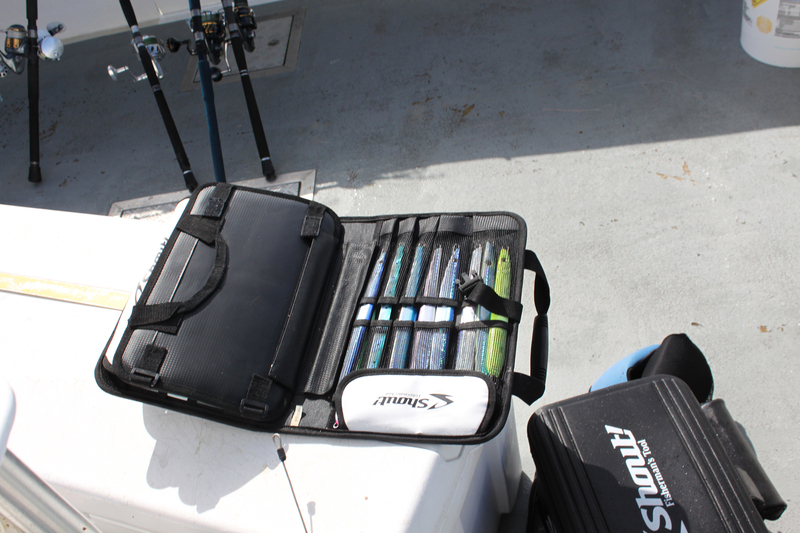 It fits the Jig System Bag with Separate Jig Bagand Planno Box and I used one of the separators to hold 4 large leader spools, one small leader spool, an extra reel spool, and a small box of hako hooks. 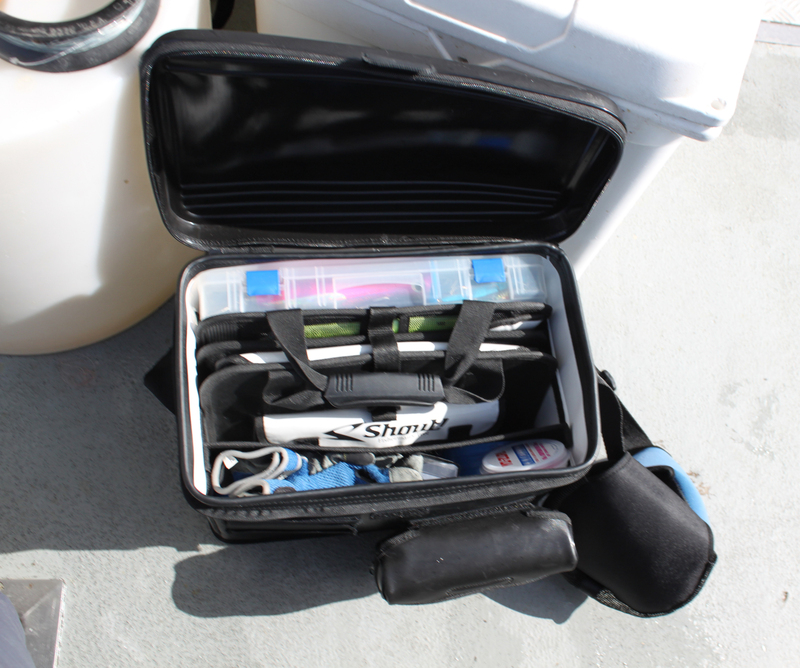 On top of all that I placed my jigging gloves and my tackle tool belt (an electrician tool holder and belt) in which I carry my split ring pliers, scissors, UV flash light, fish Dehooker, and fish deflating device. So far, so good and I am liking it. Makes it so easy to get to my jigs and leader. Post edit 6/27/13: I forgot to mention that I did not like that the bag contents are only protected by splash if the zipper is zipped. There is no material covering the edges when the zipper is unzziped, so is kind of a pain to be zipping and unzipping the bag every time you need something. 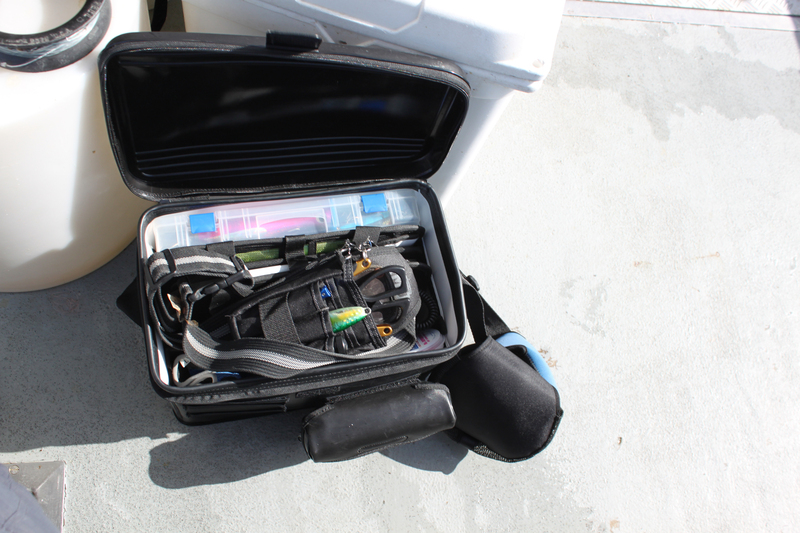 Post Edit 6/30/13- While fishing on a small craft I kept the bag’s back against the wind with the zippers open and just the Velcro closing the bag, there was absolutely no water intrusion inside the bag. With a big wave the bag fell again and it did not open, even using just the Velcro. Live and learn everyday. 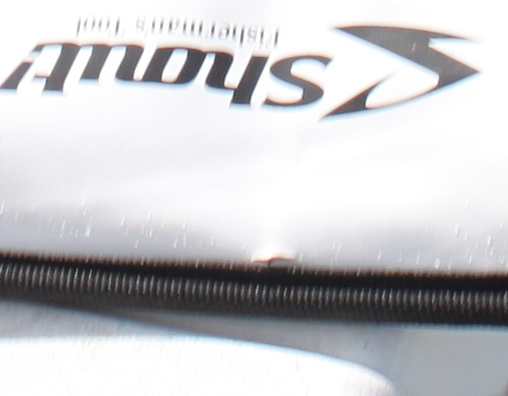 Post edit 5/4/14: Solved the splash problem by pressing the plastic behind the zippers to shape it vertically. Now there is no splash problem. 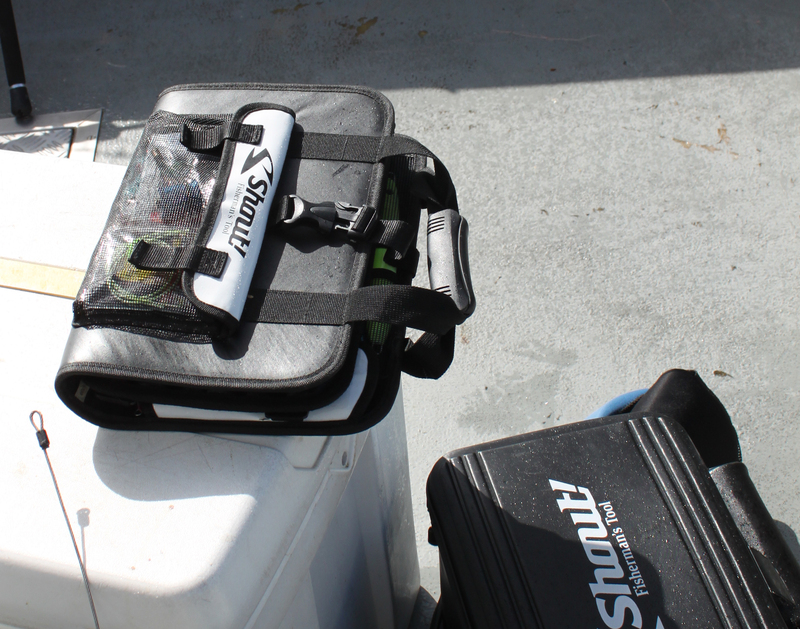 Seems that when I place my Shout Jig Bag System III over the Shout Jigger Bag it made the splash guard cave in. I no longer do that and my Shout Jigger bag no longer has an issue with water getting inside. All in all, after about two years of using it still looks about the same. This is an awesome system for people that love jigging, and no this is not an add. I did not get paid to say this. I really like the product.